The image is not mine. It was the thumbnail for a policy paper by the Illinois Policy Institute, a hard-working free-market think tank in Chicago. 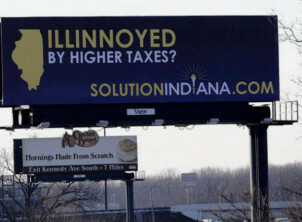 I chose to borrow it because it illustrates the campaign by Indiana to attract tax-weary Illinoisans. In doing so, Indiana participates in one of the most important economic activities of our time: tax competition. Since there is completely free movement of people and capital across state lines in the United States, the decisions by families and businesses where to reside and work is governed to a relatively large degree by factors such as the tax burden. High-tax states (count Illinois among them) lose jobs and investments to low-tax states. Politicians who want to build big governments can then sell their welfare states to taxpayers as best they can – if taxpayers prefer to keep more of their own money, and pay for more of their own consumption directly out of their own pocket, then they can choose to do so. Tax competition fulfills two major purposes. (For an excellent introduction to tax competition, please visit this site over at Center for Freedom and Prosperity.) The first purpose is to keep the free-market sector of the economy alive. When people make decisions to move, look for jobs or invest based in part on differences in taxation, it keeps us as economic agents on alert. We do not slouch on the job, we watch for better opportunities and thereby take responsibility for ourselves and those who depend on us. The second purpose is to put a cap on the growth, and ideally size, of government. If people can vote with their feet – or money – then government will at some point have to reconsider its plans to expand with yet more tax hikes. Paris has long backed the idea of an across-the-board harmonisation of EU member states’ tax systems. According to French government advisors, this must begin by a common tax base for the European banking sector, EurActiv France reports. … Those in favour of harmonisation have a mountain to climb, but have not backed away from the challenge. Experts across Europe oppose a common tax system on the basis that competition between tax systems is positive and forces governments to be more efficient. France has one of the highest levels of income tax in Europe and the government argues that low tax rates prevent the smooth working of the European Common Market. Earlier this year French President François Hollande said he wanted “harmonisation with our largest neighbours by 2020.” In a report titled Tax Harmonisation in Europe: Moving Forward, the [French government’s economic advisory council] CAE proposed three ways to tackle the negative effects of fiscal competition. The very idea that low tax rates prevent “the smooth working” of the free market in the EU is patently absurd. The argument is based on the notion that when tax rates are the same everywhere, businesses make decisions based not on taxes but on “real” business matters. But that notion disregards the fact that government is an active player in the economy, and that its services – while provided inefficiently under a coercion-based monopoly – are like most other services in the economy. I can choose to buy tax-paid services from the New York state government, or from the state of Wyoming, just as I can choose to bank with Warren Federal Credit Union or First Interstate Bank, or to buy my insurance products from Farmers, GEICO or any other insurance company. Since government is an active player in our economy, it must be subjected to the same free-market conditions as the rest of us, as far as that is possible. The first measure is to continue efforts for a common consolidated corporate tax base (CCCTB). Harmonising tax systems would make “fiscal competition more transparent and healthier,” says Agnès Bénassy-Quéré. According to Alain Trannoy, an economist who co-wrote the report, a CCCTB should be based on “reinforced cooperation or with some countries like Germany, France, the Benelux states and Italy, in order to create a snowball effect in different Eurozone countries.” Harmonising tax bases would also reduce the risks of optimisation, when multinationals transfer their revenues from one country to another in order to benefit from lower corporate tax. “Corporate tax is an important element, but there is no point if tax bases are not harmonised,” said Alain Trannoy. And now for the three-dollar bill question: once these high-tax EU states succeed in creating a high-tax cartel, what is going to happen with the tax rates? c) They will go up. You may choose whichever answer you want, so long as your choice is harmonized with the answers you do not choose. And there you have it. The real purpose behind this is to build yet another level of government spending. While it sounds noble to invest in “infrastructure” and the like, this is, after all Europe. Therefore, it is a safe bet to foresee that if this new level of government were ever to be created, its spending would go primarily toward yet more entitlement programs in an even more complex welfare state. Let’s keep in mind that there are already politicians on the left flank of European politics who are pushing hard for harmonized entitlement programs across the EU. What better venue for that harmonization than a full-fledged, EU-level welfare state? And as we all immediately understand, the world’s largest welfare state, which has not solved all the alleged problems of inequality and poverty it was created to solve, must therefore obviously become a lot bigger. Out there, on the outer left rim of unabridged statism, the question “when is government big enough?” simply does not have an answer. With the next EU Commissioner for Economic Affairs likely being a socialist, this unanswered question is going to have serious consequences for Europe. Its current journey into industrial poverty, paved by the world’s most sloth-inducing entitlement systems and fueled by the world’s highest taxes, apparently is not going fast enough.